Japanese war planners had hoped to produce 40,000 new military aircraft in 1944, but the production rate was barely half that level in the fall of 1943. Aviation plants were straining under the pressure of material shortages, maladroit logistics, and a paucity of trained machinists and engineers. Shipping losses bit deeply into deliveries of Malaysian and Jakartan bauxite, the industry’s chief source of aluminum alloys. The Mitsubishi complex in Nagoya had expanded steadily, employing 43,000 workers by the end of 1943, but it had turned out only 1,029 new Zeros in 1943, fewer than half the number demanded by the military services. The Japanese aircraft industry had relied to a disproportionate extent on a small, overworked coterie of talented craftsmen and technicians, and was never optimized for mass production. Belated efforts to introduce standard production-line techniques brought some improvement, but neither Mitsubishi nor the other major aircraft suppliers (Nakajima, Aichi, Kawasaki, Tachikawa, Yokosuka) managed to ramp up output fast enough to fill the military’s ballooning wartime orders. The image of the starving oxen pulling planes indeed captures so much of the tragic waste that was Japan’s attack on the US. 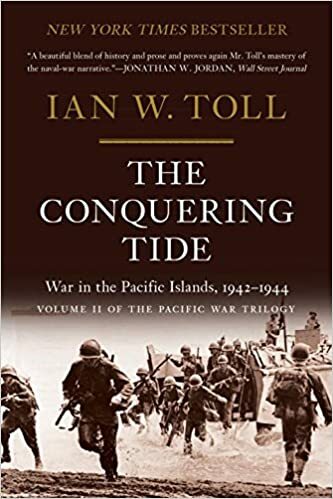 Toll’s book is really a narrative history of key military engagements, not primarily an economic or social history–but it’s nuggets like this, along with digressions on topics like Hawaiian social history and shore leave in Australia, that help make the book continuously interesting and far from narrowly focused. It’s vividly written and a marvel in clarity, no simple task given the mass of names and the obscure and complicated geography it covers.